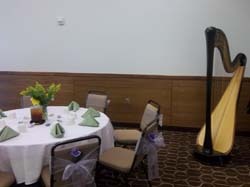 The harp is not just for the wedding day ~ I can provide music for your rehearsal dinner, engagement party, bridal shower, and wedding brunch as well! Music available ranges from Bach to Sinatra to Bollywood to Metallica, and everything in between! Check out my Repertoire List to get an idea of the variety of music that is possible on the harp. Depending upon the size of your guest list, I can amplify the harp using my own sound system or the in-house system of your venue. The music will be loud enough to be heard, but will not overpower conversation. Contact me to check availability or request a quote. Discounted rates are available for booking me as your harpist for multiple wedding events (ceremony, reception, rehearsal dinner, shower, etc. )!